After five outings at the Sawai Mansingh Stadium, the Kings XI Punjab finally have won their first game against the Rajasthan Royals. After winning the toss, the home team elected to bowl first and it was the Universe Boss- Chris Gayle who got roaring as the visitors lost the wicket of KL Rahul quite early in the game. Gayle scored 79 runs off 47 balls. Sarfaraz Khan joined the party with 46 runs from 29 balls and they posted the total of 184 runs. The hosts got off to a great start with Ajinkya Rahane and Jos Buttler blazing guns for the team. However, Rajasthan Royals’ captain Rahane was sent back to the pavilion on 27 runs. VIVO IPL 2019, RR vs KXIP: Chris Gayle's 79 Puts Punjab in Drivers Seat. Sanju Samson, Steve Smith, Ben Stokes too made way to the pavilion by scoring 30, 20 and 6 respectively. But what left the sour taste in the mouth of the fans and the hosts was Ravichandran Ashwin’s mankading incident where Jos Buttler stood shell shocked. Wickets kept falling at regular intervals for the hosts and at the end, it was KXIP who walked away with the victory. There were a few records broken during the match today at Sawai Man Singh Stadium. 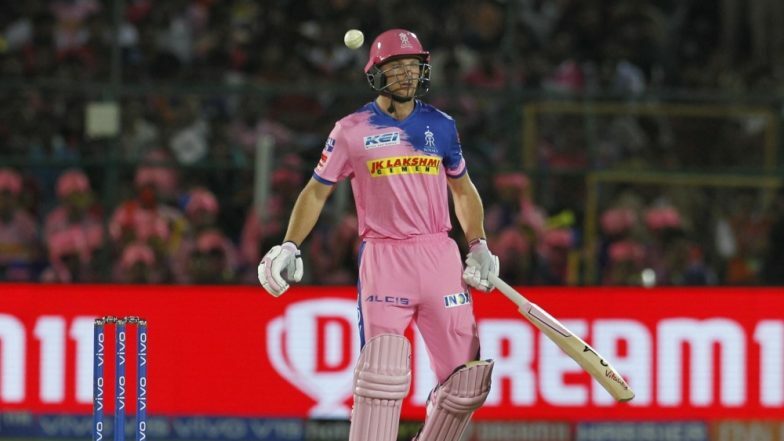 R Ashwin Run Out Jos Buttler Mankad-Style in IPL 2019, This is Second Time English Man Got Out In This Fashion; Watch Video. Check out the video of Ashwin mankading Jos Butler. # Chris Gayle went on to score the fastest 4,000 runs in the Indian Premier League (IPL) and joined the elite list of batsmen that includes Suresh Raina, Virat Kohli, Rohit Sharma, Gautam Gambhir, Robin Uthappa, Shikhar Dhawan, David Warner and MS Dhoni. # Gayle became the ninth batsman and second overseas player to score 4,000 runs in the IPL. This was Gayle’s 25th 50 in the IPL. # This was the first time in five years that Rajasthan Royals won the match in Sawai Mansingh Stadium for the first time. # This was the second time that Jos Buttler was mankaded in the cricketing history. # This was the first time in the history of IPL that a batsman was mankaded. While speaking about the incident during the presentation ceremony, Ashwin said, “It’s pretty instinctive. I actually didn't load and he left the crease. That's always been my take on it because it's my half of the crease. I was not even at the crease, he wasn't even looking at me and he just left the place. We ended on the right side of the coin.” Tomorrow, in the IPL 2019, we will have a clash between Delhi Capitals and Chennai Super Kings in Delhi.